Watching the demo of Fatshark's War of the Roses, I had to wonder, Why aren't there more team-based, melee-focused multiplayer games? At times, it seems like every other game on the store shelves seems to have a khaki-wearing soldier toting a machine gun, so I was very encouraged to see Paradox taking such a risk with this title. Talking with producer Gordon Van Dyke, himself a veteran with five year's experience on Battlefield and lead designer Marten Stormdal, who helped create the unfortunately overlooked Lead and Gold, it's clear that this is the most ambitious and most uncharacteristic title in Paradox Interactive's lineup. 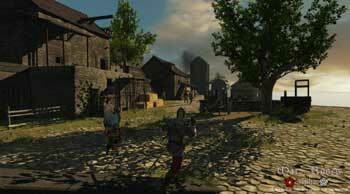 War of the Roses is an online action game set during the Middle Age conflict between the Houses of Lancaster and York. Players become medieval warriors and bash each other's heads in variety of solo and team-based modes. The game's historical setting is really just a backdrop to the action. The battles and locations may be historically inspired, but there's no overarching context for the conflict beyond the individual player's general advancement and unlocks. Rather than relying on set classes and archetypes, War of the Roses encourages players to build their characters a la carte from a wide range of options. First up, you'll want to select from the game's list of over 60 weapons. The most important is your main hand weapon. This is typically a two-handed option, like the longbow or crossbow, or perhaps a great sword or a lance. This weapon will be the most significant choice in how you play the game. Pick a bow and you'll want to engage targets at a distance. Pick a poleaxe and you'll do well against mounted knights. You'll also want to select a secondary, one-handed weapon, like a sword, axe or mace. Having this other option gives players a chance to adapt to different encounters. If you're a bowman and a knight manages to get too close, you can always pull out your hammer and defend yourself. Since this one-handed option is the only one that permits the use of a shield, some players may forego the main, two-handed option and just stick with a simple sword and shield. The developers admit that shields weren't a common sight among footmen of the period, but they included it as a regular option, both because players expect it and because it can help inexperienced players stay alive a bit longer. The final weapon is a dagger. While it's handy if your other weapons break, the dagger can also be a quicker option for close-in kills against armored opponents. Each of the weapons is balanced according to a number of factors. The large pole axes, for instance, do tremendous damage but are generally slower to use than simple swords and axes. Likewise, the crossbows are generally more accurate and deadly than regular bows, but the reload time is considerably longer.